Company: Advance Pathology Services, P.C. Cadillac, Michigan | October 27, 2010 | Dr. Frederick S. Wreford, President of Advance Pathology Services, P.C., has been recognized by Elite American Health Professionals for his dedication, achievements, and leadership in clinical pathology. Specializing in anatomic and clinical pathology, Dr. Frederick S. Wreford is an authority with over 23 years of experience in his profession. 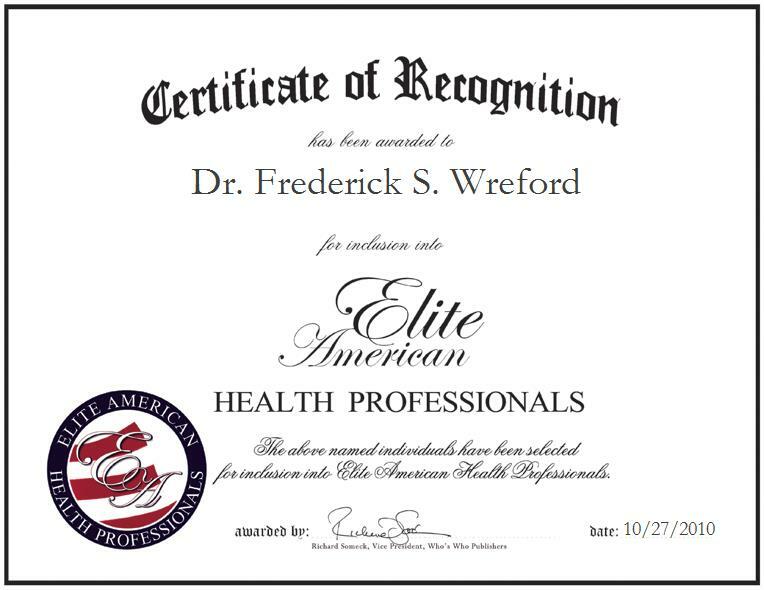 A hard working and dedicated professional, Dr. Wreford founded Advanced Pathology Services, P.C. in 2008. Advanced Pathology Services, P.C. offers laboratory medicine and clinical pathology services. Dr. Wreford is certified in anatomical and clinical pathology from the American Board of Pathology, he has a medical license from the State of Michigan, and holds a certification from the Educational Commission for Foreign Medical Graduates. He was honored by the American Medical Association with the Physician’s Recognition Award in Continuing Medical Education from 1993-1998.Dr. Wreford holds a Doctor of Medicine from the American University of the Caribbean. He holds a Master of Science in biology and microbiology from Eastern Michigan University and a Bachelor of Science in microbiology from Michigan State University. He is an esteemed member of the South Central Association for Clinical Microbiology, American Medical Association, American Society for Microbiology, and Beta Beta Beta National Biological Honor Society. Of his achievements, he is most proud of having trained as a fellow in clinical microbiology at the Cleveland Clinic Foundation. He is also a fellow in the American Society for Clinical Pathology and the College of American Pathologists. He is a diplomate of the American Board of Forensic Medicine and American Board of Forensic Examiners, a former member of the American Public Health Association and a former corporate member of Munson Healthcare in Traverse City, Michigan.For more information about Dr. Frederick S. Wreford and Advance Pathology Services, P.C., please visit the company website at http://www.gotoapservices.com.